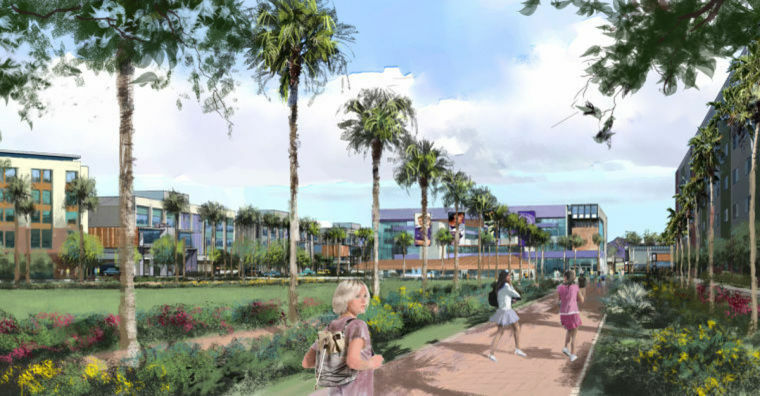 Grand Canyon University has put on hold its plans to build a major campus at Eastmark. The plans had a goal of a 2015 opening, and is now slated for 2016 opening, though some off-the-record reports stated that there was no official timeline for a campus launch at this time. Grand Canyon University CEO told investors during a conference call yesterday that the for-profit university wants to focus on expansion and growth of its main campus in Phoenix. With more and more demand at its Phoenix campus, the university will be building four new six-story dorms and a new engineering building, a parking garage, and another classroom building. Mueller noted that the campus is still dedicated to a STEM (Science, Technology, Engineering, and Mathematics) campus in the East Valley, which would complement the new STEM charter school campus opening this Fall in Eastmark. The campus that is being delayed was to be located near Ellsworth and Ray and was going to be a $150 million investment by GCU including a student union, classrooms, labs, dining facilities, and a gym. Classes were slated to begin in Fall 2015.